Ask your local SuperValu butcher to bone and butterfly the lamb for you. 2. Spread the lamb out flat on a chopping board. Mix the paprika and flour together in a small bowl, then rub this all over the outside of the lamb. Set aside while you make the stuffing. 3. Melt the butter in a small pan set over a medium-low heat. Add the chopped onion and cook for about 5 minutes, until soft but not browned. Add the rest of the stuffing ingredients and cook for a further 2 minutes, until the spinach is wilted but still bright green. 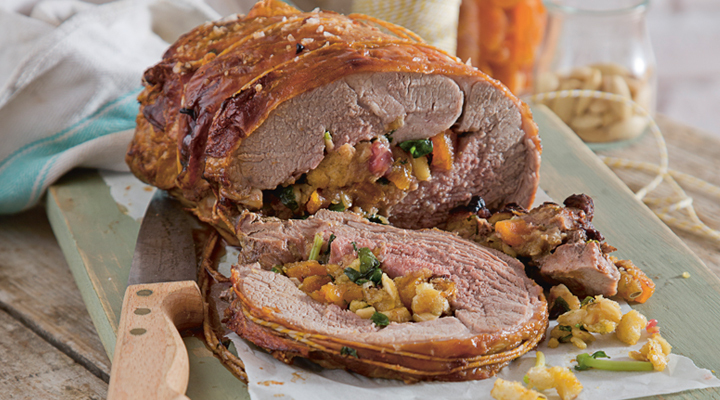 Spread the stuffing over the inside of the lamb, then roll up and tie with kitchen string at 5cm to 10cm intervals. 4. Place the lamb in a roasting tin and roast in the oven for 1 hour 35 minutes, until the internal temperature reaches 60°C. If you prefer your lamb well done, roast for 1 hour 50 minutes, until the internal temperature reaches 70°C. 5. Transfer to a chopping board and loosely cover with tin foil to keep warm. Allow to rest for 15 minutes before carving into slices. Serve with roast potatoes.